Banners are lowered to avoid the Metrolink wires, buses wait in a side street. A queue of seven buses followed the procession with more bunched up in adjoining streets. I was in Manchester this afternoon when waiting to cross the road near Piccadilly Gardens, a van pulled up. A man in a yellow vest jumped out and proceeded to strew cones and a road closed notice across the junction, much to bemusement of an approaching bus. I asked the man concerned if he was going to let the bus through and the answer was no, it will have to wait for the parade to go by – but there didn’t appear to be any signs saying that a parade would be taking place! Eventually the parade hove into sight as bus company controllers did their best to reroute and regulate services, some however just had to wait. It was a well organised and surely not spontaneous Christian religious parade with plenty of banners and statues being carried but these were the next problem. 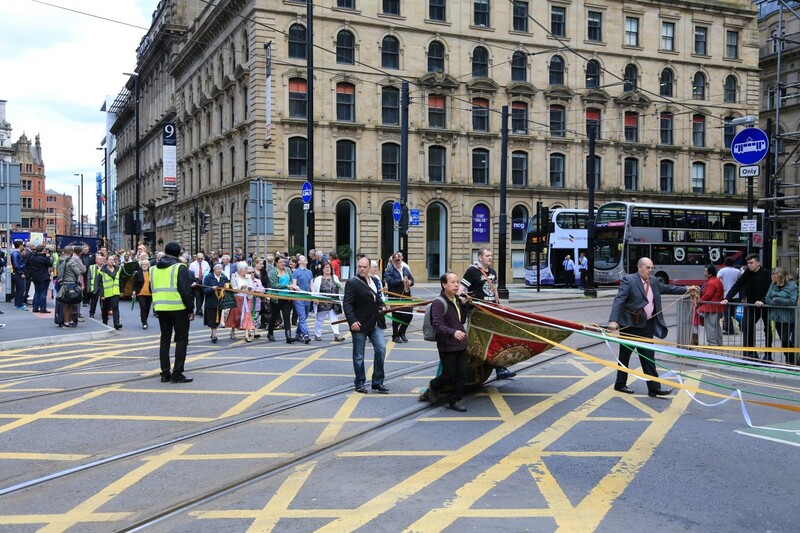 Not only did the whole parade have to halt and clear the way when a Metrolink tram appeared but each banner carrying group had to stop and lower their banner before being authorised to cross under the overhead wires. This was a time consuming exercise, by the time the last one passed Piccadilly Gardens, seven buses were queued up behind and several more waiting to cross their route. There would have been more but for the efforts of the controllers, even the flagship Vantage service was affected. 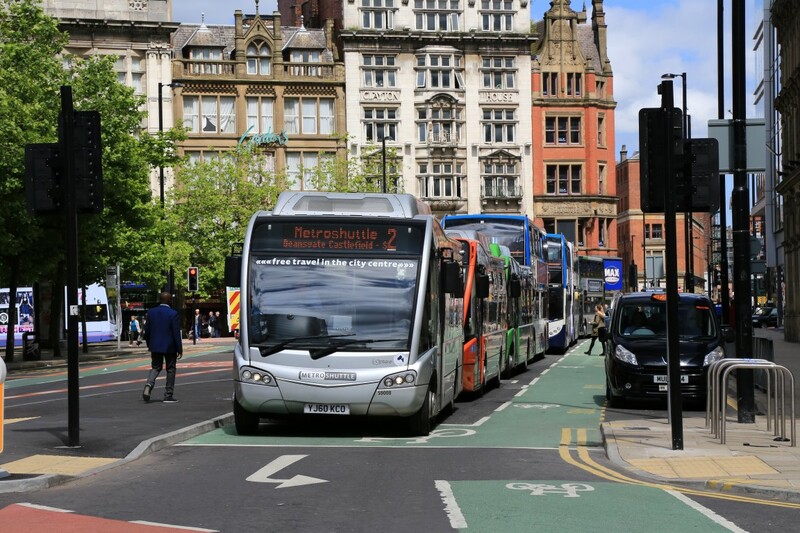 Come on Manchester, if you are serious about a high class and reliable bus service then buses need the same priority in these situations as is given to Metrolink or at least the opportunity to replan and let customers know.